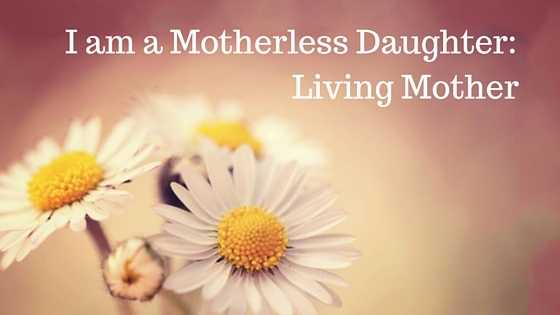 I am a motherless daughter, but it’s hard for me to define myself this way. Maybe mothered-less is a better way to describe me. I often feel like I have no right to be a part of this group of women who call themselves Motherless Daughters because my mom is still alive. But then I remember how hard I have worked over the past 30 years to get to this place of peace in my life. Just because I have a mom doesn’t mean I’ve been mothered. I grew up in a home where everything looked great in pictures, but internally much was wrong. I was not the child my parents desired, or at least it felt that way growing up. I could never earn their admiration or approval or pride or love. I remember being a young child and having a grown-up approach me at church to say, “Smile! I never see you smile.” I have a photograph of a 3 year-old me in messy curls wearing a 70’s flowered dress and a frown that betrays my sadness. The story I’ve been told is that I refused to smile for the photographer no matter what my mom did. This is one of my favorite pictures of myself, because that brave little girl wouldn’t pretend everything was okay when it wasn’t. In my family, children were meant to be quiet and respectful to adults; children were not meant to make messes; children were not meant to ask questions or disagree; children were to do what was expected of their parents and all those older than them. I have lots of memories of growing up in my family of 6, and they aren’t all bad memories. What stands out most, though, is the memories I don’t have: being hugged and kissed, being listened to, being complimented. I believed that if I was deserving of these things, I would get them, and so I worked harder and harder to earn the love I so desperately craved. At age 12, I was molested by a family member. I told my mom the same evening it happened and she asked me if maybe I had imagined it. She told me it was a serious accusation. I imagined us in a courtroom, sitting at opposing tables as we were questioned about what had happened and then waited for judgment and punishment. I believed I was protecting our family when I took back my words: Yes, I said, maybe it was just a misunderstanding. I spent the next 25 years of my life trying to earn my mother’s approval, pride, and love. I participated in extra curricular activities four nights a week, had a part-time job, earned straight A’s, and was the first person in my extended family to go to college—and on a full scholarship. It wasn’t enough to earn her approval. I graduated college in three and a half years, got a great job in my field, and later was sought after to work in a major international company. It still wasn’t enough. When I needed her, when I had the courage to face my fear of rejection and ask her for her presence, she chose her own needs or the needs of one of my siblings instead. Still today, we do that dance: she rejects me, I feel depressed and angry, I feel guilty for feeling angry, then we pretend everything is okay until she rejects me again. My mom’s inability to give me what I needed when I was growing up led me to seek comfort in other places—first from a best friend I clung to, then a string of abusive boyfriends. These boys–and later, men–gave me what I believed deep down I deserved—punishment for not being good enough. Living my life this way led to many losses: the loss of self-care, self-trust, self-respect. The loss of innocence. The loss of my ability to bear children. As I’ve come to know my Lord, I’ve learned that He had a very different plan for my life. He has helped me heal, and I’ve even been able to look at the tragedy of my mom’s childhood and understand why she was—and still is–emotionally unavailable to me. But understanding it doesn’t take away the damage that was done. My history helped form me into the woman I am. Without it, maybe I wouldn’t have come to rely on the love of Jesus like I do now. Maybe I wouldn’t have ended up with a sweet and sensitive husband and the four smart and sassy children we adopted and adore. I wouldn’t change how things turned out. But at the same time, I miss my mom as if she has already left this earth. I miss the mom I never knew.